Hefei is an ancient city that has more than 2,000 years of history. As early as the Xia (夏) and Shang (商) Dynasties period, Huaiyi people inhabited there. In spring and autumn period, Hefei belongs to Chu (楚) Country; in the period of warring states, it belongs to Wu (吴) County. After Qin (秦) Country unified the other six countries, including Qi (齐), Chu (楚), Yan (燕), Zhao (赵), Han (韩) and Wei (魏), Hefei County was established. In September, 1945, after the victory of Sino-Japanese War, the capital of Anhui Province was migrated from Jinzhai to Hefei. After the liberation, Hefei City formally becomes the capital of Anhui Province. 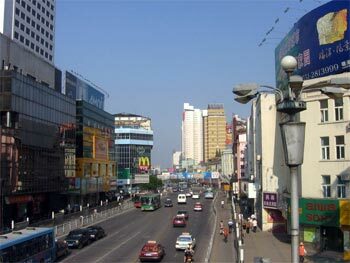 Hefei City lies in the central part of Anhui Province. It closes to Chuzhou (滁州) in the east, Liuan (六安) in the west, Chao Lake (巢湖) in the south and Huainan City(淮南市) in the north. The east longitude is between 116 degrees and 40 minutes and 117 degrees and 52 minutes; the north latitude is between 31 degrees and 30 minutes and 32 degrees and 37 minutes. This city expands to the Yuanzu Mountain in the east, Jinqiao Village of Feixi County in the west, Yangpo Village of Sanhe County in the south and Zhaoda Mountain of Changfeng County in the north. The total area is 7,266 square kilometers, which accounts for 5.2% of the whole city and 0.07% of the whole country. Moreover, the urban of Hefei city occupies 458 square kilometers. The east longitude is between 117 degrees and 4 minutes and 117 degrees and 26 minutes; the north latitude is between 31 degrees and 34 minutes and 31 degrees and 58 minutes. Hefei is one of the three national garden cities. The city green coverage rate is 30.7%, forming a unique city garden style: gardens in the city and city in the garden. So this city honors “Green City”. Hefei has two national forest parks: Shungeng Mountain (舜耕山) National Forest Park and the Purple Mountain (紫蓬山) National Forest Park. In addition, the area also has beautiful Shushan Mountain (蜀山) National Forest Park and Siding (Four Peaks) Mountain (四顶山) National Forest Park. Besides the Chao Lake, which is 782 square kilometers away from urban, there are extra scenic spots: Shushan Lake (蜀山湖) formed by volcanic movement, Daishan Lake (黛山湖) , Nanfei River (南淝河) , Modun Reservoir (磨墩水库) and Dayan Bay Reservoir (大堰水库). Among them, Chao Lake has the initial conditions to become a national scenic area. Hefei belongs to humid subtropical monsoon climate. It is mild and the four seasons distinct clear. The average annual temperature is 15.7 centigrade. In spring, the cold and warm air move frequently. It only lasts about 70 days. In summer, it is so hot and often lasts over 120 days. People call the rain that falls in the first month of the summer “plum rains’. In autumn, the weather makes people feel comfortable. But the pleasant climate can only last 60 days. In winter, due to the northern cold air, the temperature is lower; the rain and snow are less; and the pressure is higher. Every year, the average rainfall is 998.4 mm. The precipitation, which mainly concentrated in June or August, accounts for 41% of the whole year. The average annual evaporation is about 1,514 mm. The frost-free period often lasts 230 days and the frozen period lasts 82 days. Hefei belongs to the first line inland city of East China that closes to the coastal areas. It is in the prominent strategic position. Now Hefei city has developed four pillar industries: electric industry, such as refrigerators, washing machines, television sets and air-conditioner; machinery industry, such as automobiles, forklifts, excavator, etc; chemical industry, such as tires, household chemicals and fertilizers; and materials industry. Hefei is the national technology innovation city. The newly established enterprises with different types have 14. This city has a large-scale agricultural base to raise poultry and plant vegetables. Nowadays, there are more than 20 large and modern theaters in Hefei. It also have provincial and municipal libraries, provincial and municipal stadium, provincial museum and cultural palaces. Located in the center of the city, the provincial museum is nearly 16,000 square kilometers with over 100,000 various cultural relics, 136 of which are as the first-level national heritage, including some bonze vessels, painting masterpieces and carving handicrafts.